The food and fibre chapter in the most recent IPCC report, the AR4 (Easterling et al., 2007) provides a comprehensive update of findings since the Third Assessment Report. Effects of elevated CO2: Studies at plot level over the last few decades have indicated that plant biomass and yield increase significantly at higher than present CO2 levels. There are two responses involved; the photosynthetic response which leads to increased plant productivity, and the crop yield response. The crop yield response is lower than the photosynthetic response, however it could potentially lead to increases in yield of up to 20% (Nowak et al., 2004; Ainsworth and Long 2005; Long et al., 2004). The effects of elevated CO2 on plant growth and yield however will depend on photosynthetic pathway, species, growth stage and management regime (Jablonski et al., 2008; Kimball et al., 2002; Norby et al., 2003). It was recently suggested (Long et al., 2005; 2006) that crop responses to elevated CO2 were not as high as previously thought, however the latest research (Tubiello et al., 2006) has confirmed the original findings with new results. Suggestions that current impact assessment simulation results are too optimistic in their assumptions about CO2 response are now shown to be incorrect (Tubiello et al., 2007). While the effect of CO2 may show positive effects on plant growth in experiments, the results of plot level experiments are likely to overestimate the reality of the CO2 response because of complicating factors which occur in the real world and not in the experiments, such as pests and weeds, lack of and competition for other necessary resources, and extreme events. These interactions are not well understood at large scales nor well implemented in leading models (Easterling et al., 2007). Source: Adapted from Easterling et al., 2007. Interactions of elevated CO2 with other factors: Although an increase in CO2 in isolation from other factors is shown to increase crop growth and productivity, these effects will often be countered in reality by other changes in the system. Higher temperatures during certain growth stages may be detrimental to yield and quality (Caldwell et al., 2005; Baker, 2004; Thomas et al., 2003). Increased growth caused by elevated CO2 may lead to greater water demand (Xiao et al., 2005), which in many parts of the world may be combined with increasing pressure on water resources, which may also be declining, and hence become a limiting factor. Climate impacts on crops may depend heavily on the precipitation scenario considered. Similarly, the availability of soil nutrients such as nitrogen and phosphorus may also prove to be limiting factors in the CO2 response. Studies have shown that high soil N contents increase the relative response to elevated CO2 concentrations (Nowak et al., 2004). Increased frequency of extreme events: The increased frequency and intensity of extreme events, such as floods, droughts, heat waves, and windstorms is likely to lead to greater production losses than any increase in mean temperature (Porter and Semenov 2005). Both short duration events such as heatwaves and floods, as well as longer-term events with sustained above normal temperatures have the potential to cause considerable damage to crops and yields depending on their occurrence in the growing season. Large-scale circulation changes such as the El-Nino Southern Oscillation (ENSO) have important impacts on production and therefore GDP. In Australia the effect of the drought in 2002-03 caused a reduction in GDP of 1.6% (O'Meagher 2005). 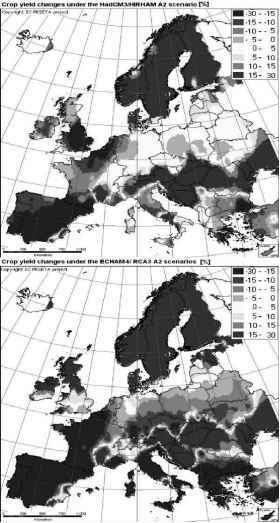 The 2003 heatwave in Europe, which broke several temperature records, resulted in a fall in corn yield in Italy of 36% (Cias et al., 2005), and is likely to be indicative of future summers (Schaer et al., 2004). Understanding the links between increased frequency of extreme events and ecosystem disturbances is very important, however few models consider effects of climate variability as well as mean variables. Impacts on weeds, pests, diseases and animal health: Although the qualitative picture of interactions between CO2 and pests, diseases and weeds is understood, quantitative information is currently still lacking. Interactions between CO2 and temperature are recognised as a key determinant in plant damage from pests in the future, and interactions between CO2 and precipitation are also likely to be important (Zvera and Kozlov, 2006; Stacey and Fellows, 2002). However, most studies continue to investigate pest damage in response to either CO2 (Agrell et al., 2004; Chakraborty and Datta 2003; Chen et al., 2005) or temperature, but not in combination. Increased climate extremes may promote plant disease and pest outbreaks. Studies have shown that the spread of animal diseases from low to mid-latitudes is occurring already. Bluetongue, a disease affecting sheep and cattle, and is already spreading from the tropics to the mid-latitudes including France, the United Kingdom and Nordic countries, while cattle tick (Boophilus microplus) may affect the Australian beef industry. Rosenzweig et al. (2000, 2001) review the major threats to agriculture associated with diseases and pests as well as drought and floods with global evidence and examples from the US. They highlight the 1988 drought in the US Midwest that cost USD 3 billion in compensation and subsidies. The Mississippi floods of summer 1993 affected 16 000 square miles of farmland with 11 million acres of crops damaged, with an estimated cost of USD 23 billion, as well as emergency measures to drain land in Iowa alone costing USD 222 million. 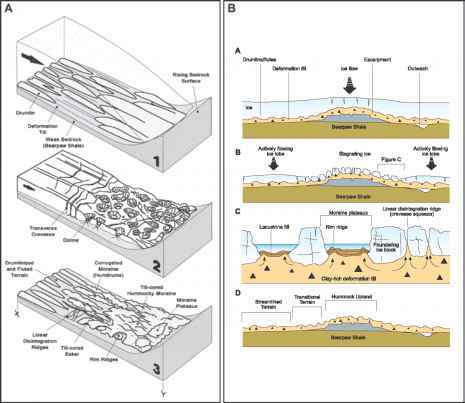 In terms of pathogens, these floods contributed to the so-called "Dead Zone" of algal bloom in the Gulf of Mexico through nutrients and other chemicals runoff into the Mississippi (Rosenzweig et al., 2001). The ranges of particular pests in the United States, including the soybean cyst nematode and corn grey leaf blight, have expanded since the 1970s due to increasingly favourable climatic conditions. Projections of climate change globally show that higher temperatures and greater precipitation (in some regions) are likely to result in the spread of novel pathogens and diseases. Shorter winters lead to less insect kill and wet vegetation promotes proliferation of bacteria, while prolonged dry periods (in other regions) encourage insect-promoted diseases. Such indirect impacts of climate change on agriculture are potentially important but a largely unknown impact. Sudden changes in climate, such as severe weather events, often result in large losses to stock in confined cattle lots, as they have no prior conditioning to these events (Mader, 2003). High temperatures and droughts are likely to induce increases in mortality, yields and conception rates, for animals not accustomed to the higher temperatures (IPCC, 2007). Interaction with air pollutants: Tropospheric ozone has been shown to have significant adverse effects on crop yields, pasture and forest growth, and species composition (IPCC, 2007). Direct and indirect interactions between global ozone and elevated CO2 is likely to further modify plant dynamics (Fiscus et al., 2005; Booker et al., 2005). Although it has been shown that elevated CO2 may minimise negative impacts from ozone, the interactions between the two have not been considered sufficiently in current risk assessments. Vulnerability of carbon pools: Climate change has the potential to affect the global terrestrial carbon sink and to further perturb atmospheric CO2 concentrations (Cias et al., 2005; Betts et al., 2004). Land-use planning and management practices, including set-aside policies, reforestation, and N fertilization, irrigation and tillage practices all have the potential to affect future changes in carbon stocks and fluxes. Carbon stored in soil organic matter has been shown to be affected by atmospheric CO2 levels (Allard et al., 2005; Gill et al., 2002), temperature (Ciais et al., 2005), and air pollution (Loya et al., 2003; Booker et al., 2005), although considerable uncertainty remains. These relationships highlight the importance of coordinating adaptation and mitigation strategies and considering the effects of climate policy on land-use change and long-term sustainability of production systems (Rosenzweig et al., 2007). Impact assessments: Results from integrated assessment and crop models over the 20 years indicate consistently that impacts in the agricultural sector are likely to be small in the first half of the 21st century — although they are likely to become increasingly negative in the second half, as mean temperatures increase (IPCC, 2007; 2001). However, uncertainties which could potentially alter these findings consist of a range of factors, from the strength and saturation point of the elevated CO2 response of crops grown in real fields rather than experimental plots, to the timing and implementation of adaptation strategies and the interaction between mitigation and adaptation strategies (Tubiello et al., 2007). • Increases in the frequency of climate extremes may lower crop yields beyond the impacts of mean climate change. Long-term yields may be affected by the increased occurrence of extreme weather events, which may directly damage crops at crucial developmental stages, or may make the timing of field applications more difficult, reducing the efficiency of farm inputs (Porter and Semenov, 2005, Antle et al., 2004). • Impacts of climate change on irrigation water requirements may be large. Recent studies have found that there may be a global increase of net crop irrigation requirements of 5-8% by 2070, with considerable regional variation (Doll, 2002). Increases in water stress are projected for the Middle East and south-east Asia (Fischer et al., 2007; Arnell, 2004). These increases in irrigation water requirements may undermine any potential positive effect of CO2 fertilization. • Stabilisation of CO2 concentrations reduces damage to crop production in the long term. Overall impacts on global crop production are projected to be significantly less under lower levels of CO2 stabilisation (Arnell, 2004; Tubiello and Fischer, 2007) (i.e. at 550ppm compared to 750ppm or a BAU scenario). In the first half of this century, some regions may be worse off with mitigation than without, because of lower CO2 levels and resulting lack of CO2 stimulation effects on crops (Tubiello and Fischer, 2007). Synthesis studies: Results of synthesis studies (although containing considerable uncertainty due to discrepancies between the models in precipitation change, poor representation of extreme events, and the assumed strength of CO2 fertilization), indicate that moderate to medium local increases in temperature (up to 3°C) can have small beneficial impacts on the main cereal crops. However, further warming is expected to have increasingly negative impacts. In low-latitude regions, even moderate temperature increases are likely to have negative yield impacts for major cereal crops. Above 3°C, average impacts are stressful to all crops and in all regions (Easterling et al., 2007). Global production potential, or Net Primary Productivity, may be threatened at +1° local temperature change and is likely to decline beyond 3°C. Precipitation changed may affect production responses beyond the temperature signal. Figure 2.2 shows simulated crop yield changes by 2080s relative to the period 1961-90 according to a high emission scenario (SRES A2 - please refer to Box 3.3 for a description of the scenario) and two different climate models: (upper) HadCM3/HIRHAM; (lower) ECHAM4/RCA3, map elaboration by EC JRC/IES. These figures are produced as part of the PESETA project.1 The PESETA results assume a relatively optimistic degree of adaptation where farmers can use as much additional irrigation water and/or fertilizers as wished, without any constraint. In these simulations, current land-use patterns are assumed to remain constant until 2085, as are agricultural policies. The maps provide indications of the general spatial pattern of changes in agriculture yields across Europe. Results for two different global circulation models are presented, using the same socio-economic scenario and GHG emissions. The lower map generally shows larger changes in crop yields than the upper map, due to the different climate conditions. Considerable research has been carried out on cereals but the effect of climate change on other crops, such as root crops, brassica and millet etc. has not been studied as much. These other crops are of considerable importance to the rural poor in many countries and this is therefore an important area of future research. 1. Upper: HadCM3/HIRHAM; Lower: ECHAM4/RCA3. Map elaboration by EC JRC/IES (PESETA).